ASP Los Baños Laguna Mrs. Veronica Chavez and Mrs. Catherine Lopez facilitated seminar on "The Fundamentals in the Care and Management of Children with Disability" last 19 July 19 2016 at the Sanguniang Hall of the Alfonso Central School in Alfonso, Cavite. 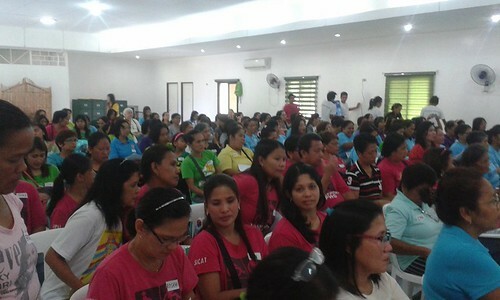 Day care workers, barangay health workers, teachers from elementary schools from BMS, PDAO officials, parents with CWD and members of ASP Alfonso Chapter. The said event was a joint effort of the municipal goverment headed by Mayor Virgilio Varias, Vice-Mayor Randy Salamat, Sanggunian Bayan Member Carol Rivera, MSWDO officer Gina T. Vedan, DepEd District Supervisor Milagros Norcio, Alfonso SPED Center, PDAO and the Autism Society Philippines. About the contributor: Noleth Rozul is a college graduate B.S medical technology at De Ocampo Memorial College Manila. A fulltime housewife married for 19 years, she now serves as Secretary to ASP Alfonso Chapter.